ISLAMABAD: Axact CEO Shoaib Sheikh has been arrested by Federal Investigation Agency in a fake degree case. Sheikh was arrested after a local court summoned him for a hearing on Wednesday. A senior FIA official has also confirmed Sheikh’s arrest. Earlier in July, a district and session court in Islamabad had slapped Sheikh and 22 others with Rs. 1 million fine on each with 20 years imprisonment in Axact fake degree scandal case. Another verdict under sections 419 and 420 of Pakistan Penal Code sentenced Sheikh and others to three years and fined Rs0.3 million each. They were also sentenced to 7 years each on violation of sections 468 and 471, and fined Rs1 million each. Further verdicts had acquitted Sheikh’s spouse Ayesha Shoaib, Col (retd.) Jamil Ahmed and Lt-Col (retd.) Muhammad Younas— failing to pay fines could extend six months in their jail terms. The trial court judge had earlier acquitted Axact CEO and others accused in the case, where additional district and sessions judge Pervaizul Qadir Memon had confessed to receiving Rs5 million for acquitting Shoaib Sheikh in the case. The issue came to the fore in 2015 when New York Times published an article, claiming Axact sold fake degrees online through hundreds of fictitious schools. 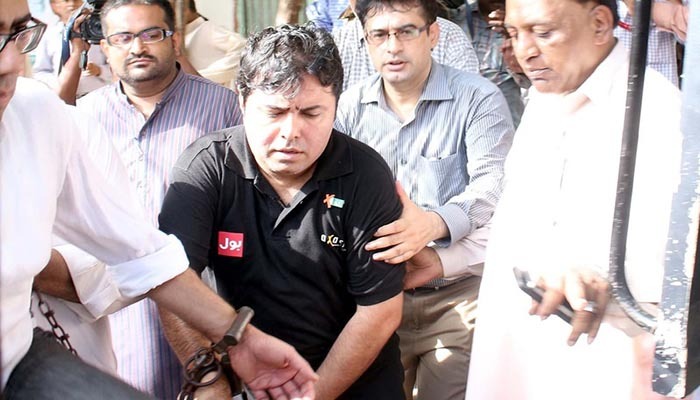 CEO Axact Shoaib Sheikh was earlier arrested by FIA in July this year for providing fake degrees online through hundreds of fictitious schools.